Tom Murtagh worked in key senior leadership roles in both the Northern Ireland Prison Service and Her Majesty's Prison Service of England and Wales. He earned a reputation of being an insightful, strong and (especially) resilient leader - a leader who consistently demonstrated the ability to cut through to the core of an issue. So much of what has been written on prisons - and I've read a great deal of it - has been done so by those who were not participants at the material time. It is therefore extremely valuable to read Tom's account. There is an enduring fallacy, certainly within the criminal justice system in Northern Ireland, that prisons can be run, inspected and written about by generalists. I do not subscribe to this view, and this is a theme that is explored in Tom's book. Those who have had the privilege of governing a prison are aware of the challenges; equally those who have not governed cannot imagine what it takes. 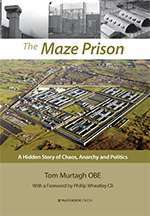 The Maze Prison: A Hidden Story of Chaos, Anarchy and Politics has many very strong themes running throughout it. As a former in-charge Governor, I can empathise with the author's observations and concerns. It was my experience that senior civil servants wanted the perfect omelette, but no eggs were to be broken. Sometimes it felt like there were no eggs provided at all. Governors were expected to achieve, and were constantly reminded of their responsibilities, but all stakeholders had to be kept happy. This is often an impossible balance to strike. While the need for compromise remained a theme throughout my service, it was particularly an issue in The Maze Prison. I can well recall many of the examples of blatant concessions that Tom mentions. This was at a time in a prison where the abnormal became normal. The author exposes the myth that The Maze Prison was just an operational problem, rather than a political problem set in an operational environment. You can also read John Semple's review of The Maze Prison. Alan Longwell was a Governor in the Northern Ireland Prison Service from 1986 until his retirement in 2015. During his career he experienced working in most NI prisons and within headquarters. He served in various senior managerial roles in The Maze Prison between 1988 and 1992 and between 1994 and 2000 including a period as Deputy Governor. Alan is a former in-charge Governor of HMP Magilligan and was Governor in charge of HMP Maghaberry between 2005 and 2009 and latterly in 2014.